Casa Battlò, one of Antoni Gaudi’s architectural masterpieces, in the Eixample district of Barcelona. All photos ©2016 by Gerry Dawes. When I received an invitation for the National Tourist Office of Spain (Turespaña) to go on a wine adventure in Catalunya, promoting some newly developed wine routes in the four provinces (Barcelona, Girona, Lleida and Tarragona) in this enticing corner of northeastern Spain. I jumped at the chance. This trip would also give me an opportunity to return to Barcelona, a city I have been visiting since 1970--I never miss a chance to visit to that vibrant, sophisticated, yet rough-cut jewel of a city, which really embedded itself in my soul when I went there to work as an extra on The Great White Hope and had anecdotal experiences with then budding supper star, James Earl Jones. 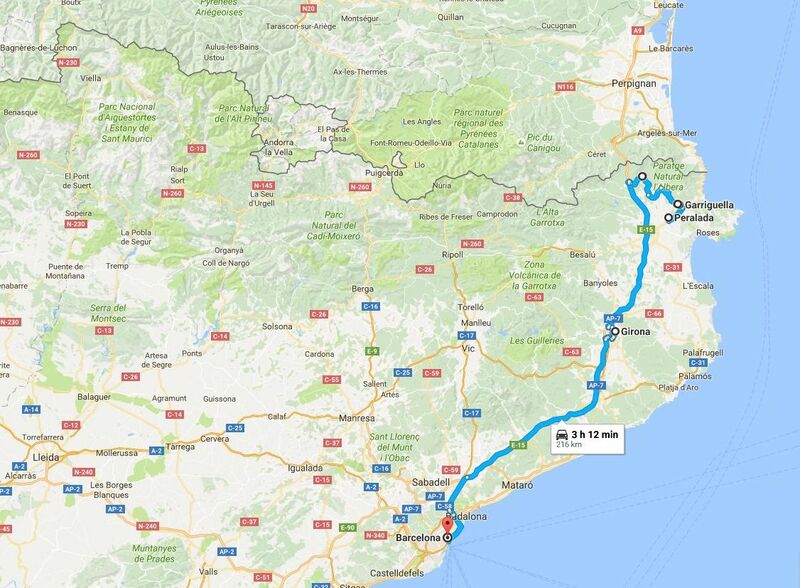 After my film worked ended, I stayed on in Barcelona for a couple more months, perhaps one month in total. The Barcelona immersion worked and I have been coming back ever since, usually two-three times per year. 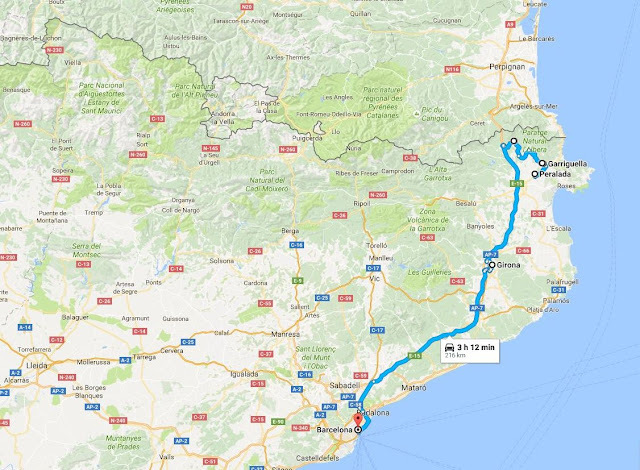 And, the Catalan part of the trip would end in Girona, a compelling provincial capital with a beautiful old Jewish quarter that I had only recently come to know. Steps down a steep, narrow street in the old Jewish Quarter of Girona, Catalunya, one of the most important Jewish heritage cities in Spain. Photo by Gerry Dawes©2016 / gerrydawes@aol.com / Facebook / Twitter / Pinterest. Canon EOS 6D / Canon 24-105mm f/4L IS USM. Gerry Dawes, Juan Súarez, Ferran Adrià, Juan´s wife Esmeralda Capel (one of the Directors of Madrid Fusion) and my fiancee Kay Balun in the kitchen at elBulli, Dec. 4, 2010. 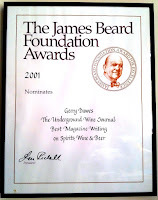 Photo by the late Juli Soler, co-owner of elBulli. 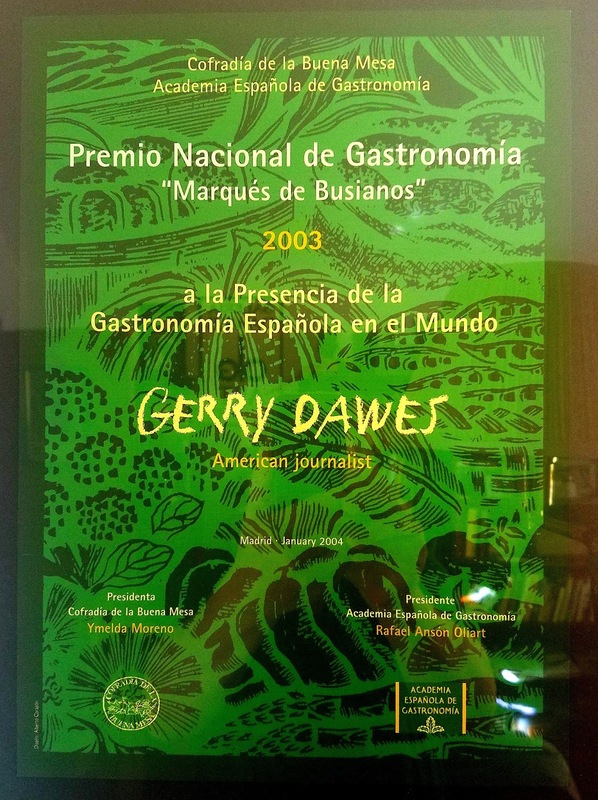 I had spent considerable time in Girona province when I went there to have lunch or dinner five times from 1997 to 2010 at Ferran Adrià´s and Juli Soler´s elBulli at Cala Montjoi, ate at the super star Roca brothers Celler de Can Roca (and drank excellent Cava with Jordi Roca and his parents at their traditional cuisine restaurant next door on their day off), explored the great Salvador Dalí´s shrines in Figueres, Cadaqués-Port Lligat and Pubol and drove on twisting roads to many of the towns and villages on the rocky Costa Brava. Despite having visited some 700 wineries in Spain over the past forty years, many of them more than a dozen times each, I knew relatively little about some of the Catalan wine regions we were going to visit. Although I had been in Penedès on numerous occasions and had visited at least of score of Cava producers in Sant Sadurní d'Anoia over the years, I had been to very few wineries in the other two wine regions we were going to visit: Empordà in Girona province and the up-and-coming Costers del Segre in Lleida province. 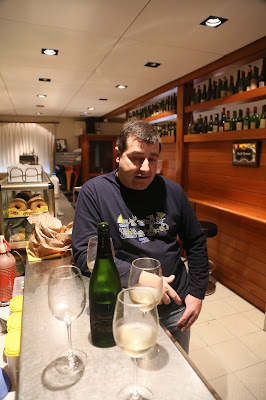 Drinking Cava with Pitu Roca, Partner, Maitre'd and Beverage Director, Cellar de Can Roca, Girona. Photo by Gerry Dawes©2016 / gerrydawes@aol.com / Facebook / Twitter / Pinterest. Canon EOS 6D / Canon 24-105mm f/4L IS USM. All photos ©2016 by Gerry Dawes. And a couple of years ago I was lucky to have as a friend and guide, Yvon Más, who expanded the horizons of one of my avocations, exploring the Jewish quarters of Spain. Más, who I reccommend very, very highly as a guide (contact: yvanmas@hotmail.com), not only gave me a marvelous introduction to Jewish Girona, he also took me to an exceptionally memorable lunch at Restaurante Ibèric in the town of Ullastret, 35 kilometers from Girona. Artist – Girona guide Yvon Màs watches the owner pulling a bogavante lobster out on the tanks at Restaurante Ibèric, a marvelous regional cuisine restaurant in Ullastret on the Costa Brava in Girona province. All photos ©2016 by Gerry Dawes. 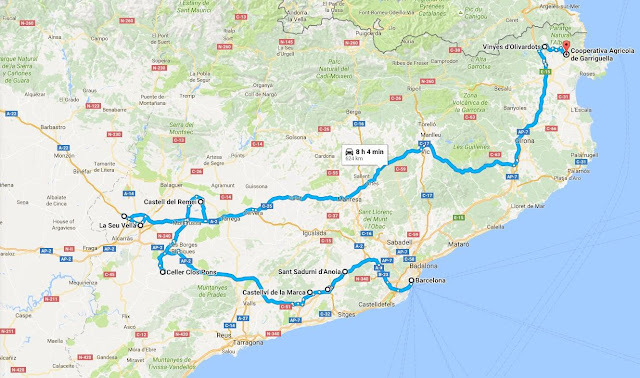 This time we were embarking on an ambitious trip, since we were going to cram in a lot of visits--eight wineries, a Cava museum, the magnificent Seu Vella Cathedral in Lleida, a couple of golf hotels, a castle-casino and a guided tour of Girona--and cover over 1050 kilometers (about 650 miles) in a mini/bus in just four days! 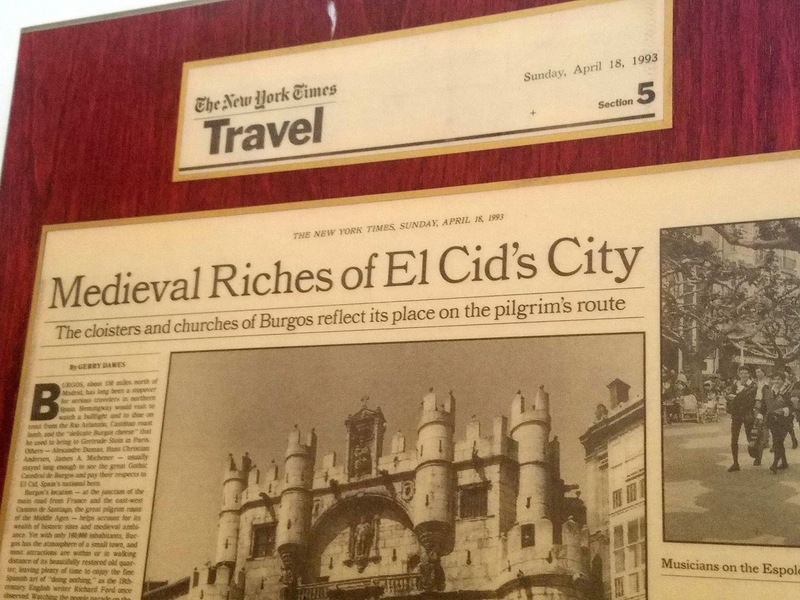 Because of itineraries like this, which I have been doing versions of in Spain for more than forty years, I never arrive the same day as the group I might be traveling with, so Brad Haskel and I flew into Barcelona a day early. We should have arrived two days early, as it turned out! The first night's lodging was on us, so I booked Brad and me in Pensión Casa Blanca on Vía Layetana, one of the two main arteries that run from the Plaza de Catalunya to the port and bisects the Barri Goti, Barcelona’s exotic old quarter, which in some sections is an ancient labyrinth of narrow streets and lively plazas. The Casablanca, itself exotic sounding, had some decent reviews on-line, so I booked a room where we could stash our luggage, shower, nap and perhaps then catch the train to San Sadurni d’Anoia, the Cava and sparkling wine capital of Spain, where we hoped to have a visit early the next morning with star sparkling wine producer, AT Roca. We would then rendezvous with the Spanish Tourist Office group, who was beginning our wine tour in Sant Sadurni in mid-morning. After a couple of re-rings, the door was opened by the pensión manager, who let us into the silence of the darkened hall. The manager (owner?) seemed none to happy to see us and had obviously just gotten out of bed, uncombed hair, sleepy look and all, to answer the bell. His whole demeanor suggested that we were obviously not up on our arrival timing etiquette, at least not at Pensión Casa Blanca, which certainly at first glance, did not seem to be a place where we might encounter latter day incarnations of Humphrey Bogart’s Mr. Rick, let alone the breathtaking soft-focus beauty of Ingrid Bergman’s Ilsa from the movie Casablanca. The manager informed us that all the other guests were asleep and the pensión was full. He would stash our luggage, but our room would not be available until at least 1:30 p.m.! So much for a shower and a nap. We left our luggage and headed for the Boquería, the world-famous market, whose main entrance on the equally famous street, Les Rambles, was a meandering 20-minute stroll across the Barri Goti. Photo: Gerry Dawes©2016 / gerrydawes@gmail.com. petit poble (small village) inside the big city.” - - Quím Marquéz, Chef-owner, Quím de la Boquería, Parada 606 (location), El Mercat de La Boquería. “For forty years I have been traveling in the patrias chicas of the Iberian Peninsula. I lived for eight years in Andalucía and have repeatedly crisscrossed El País Vasco, Galicia, Valencia, Navarra, Aragón, La Rioja, Asturias, Extremadura, the lands of Castilla y León, and all of the other provinces of Iberia, including Catalunya. Over these decades of travel, I have come to love many "pueblos" across the vast, wonderful and exotic Iberian landscape-Sanlúcar de Barrameda (where my soul resides) and Ronda in Andalucía, there are others such as Chinchón just outside Madrid; Covarrubias (Burgos); Burguete (Navarra); Haro (La Rioja), Cangas de Onís (Asturias), Gratallops (Tarragona) and Cadaqués (Girona), among many. Photo by Gerry Dawes©2016 / gerrydawes@aol.com. Photo by Gerry Dawes©2016 / gerrydawes@aol.com / Facebook / Twitter / Pinterest. Panasonic Lumix DMC ZS30 43-86mm f3.3 – f6.4. But, this was a Monday, and a number of stalls, especially the spectacular fishmonger stands, are closed, as is the legendary Quím de la Boquería, owned by my good friend Quím Marquez, who with his practiced crew manages to turn out some of the best, freshest food in Barcelona while playing a constant game of dodge-em with their half dozen co-workers, all jockeying for position in a kitchen-bar-food display area that is probably no more than 12 feet square. Quím and his crew, including his movie-star handsome twenty-something son Yuri, cooking on a rugged looking professional grade gas stove juggle multiple pans, flipping the food in the them so it cooks evenly, then plating each dish and getting it piping hot to the counters surrounding this three-ring circus. 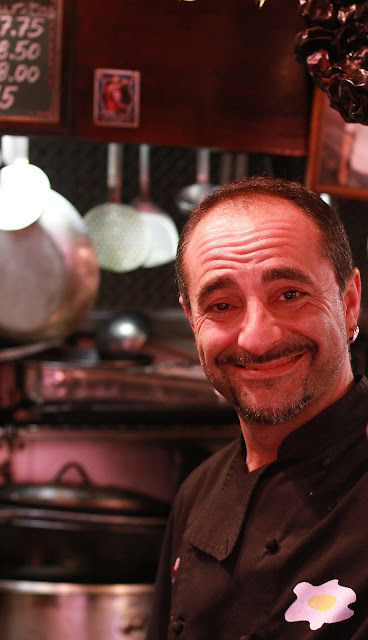 Quím Marquéz, Chef-owner, Quím de la Boquería, legendary market bar, whose slogan is "El Arte de Comer en Un Taburete" (The Art of Eating on a Barstool). Photo by Gerry Dawes©2016 / gerrydawes@aol.com / Facebook / Twitter / Pinterest. Canon EOS 6D / Tokina 17-35mm f/4. The counters are lined two to three deep with customers waiting for a taburete, or bar stool to open up. 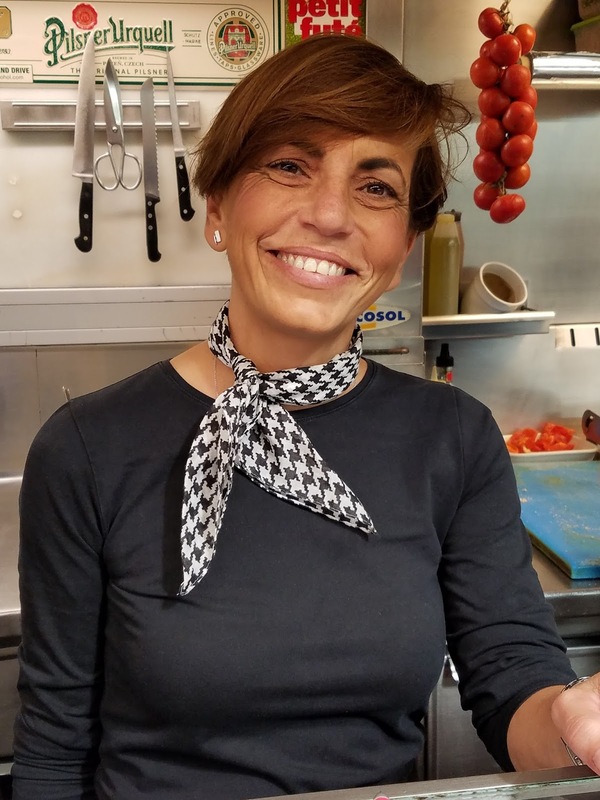 Others in the crew take orders, pop Cava sparkling wine corks, pull corks on bottles of Catalan table wines, and draw draft beer expertly, pouring non-stop and serving plates of often quite original food as they come off the line. And this is just during the breakfast rush! This show goes on until 4 p.m. every day. 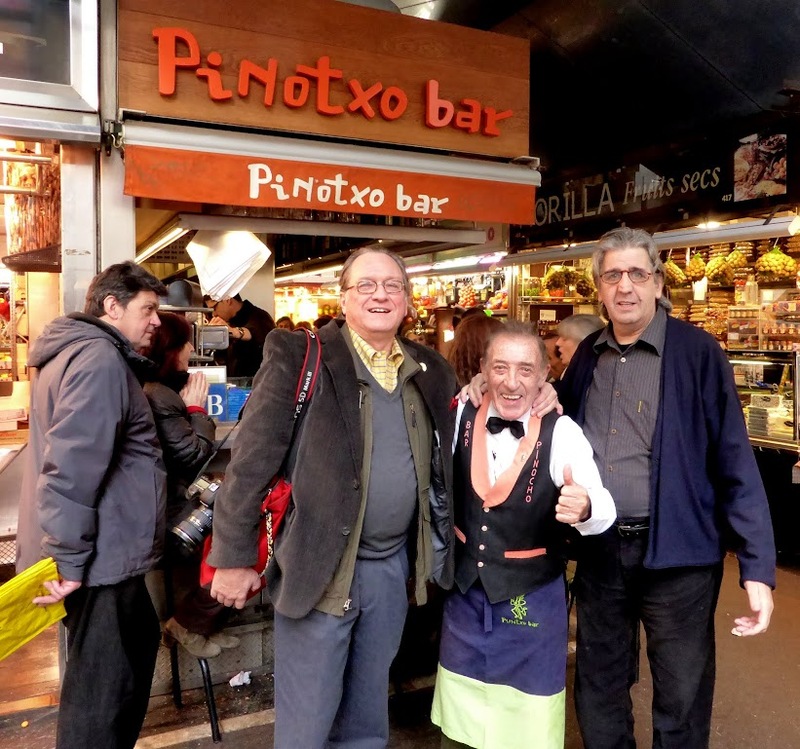 Gerry Dawes, Pinotxo Bar owner Juanito Bayen and elBulli owner, the late Juli Soler at Pinotxo Bar, Barcelona, Jan. 14, 2014. Fortunately for us, Pintoxo Bar, another long-time favorite of mine, which I have been frequenting since 1992--in 2015 Pinotxo celebrated its 75th year of operation (opened 1940)--is open on Mondays and my old friend Jordi Asín, the chef and nephew of the market legend, “thumbs-up” (always for photographs) owner Juanito Bayen was there and so was Juanito himself. 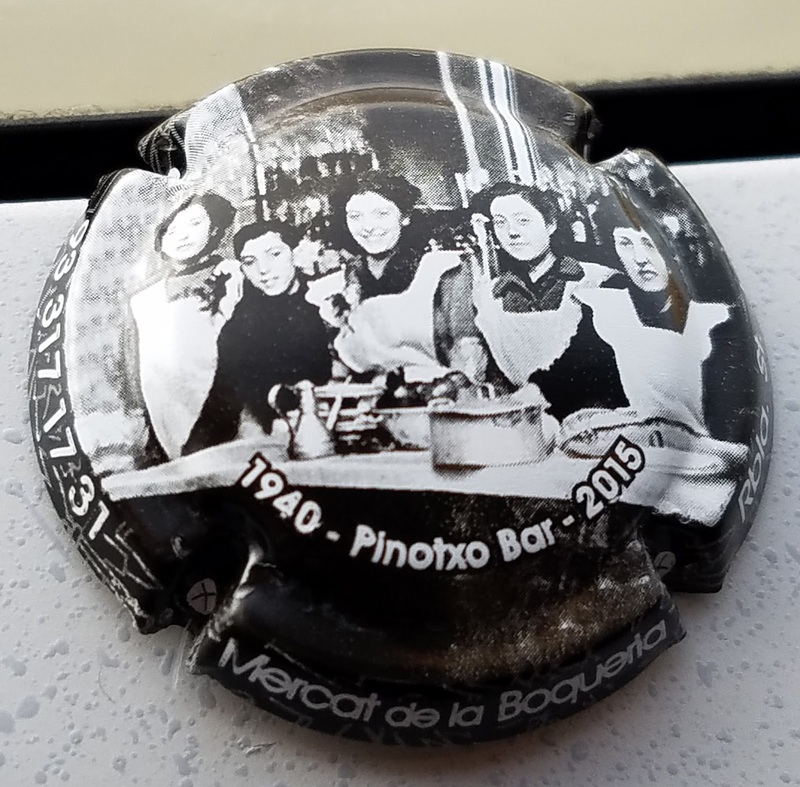 Cap from a house Cava stopper celebrating Pinotxo Bar's 75th Anniversary. We soon found seats at the counter and what turned out to be our never-ending breakfast got underway. 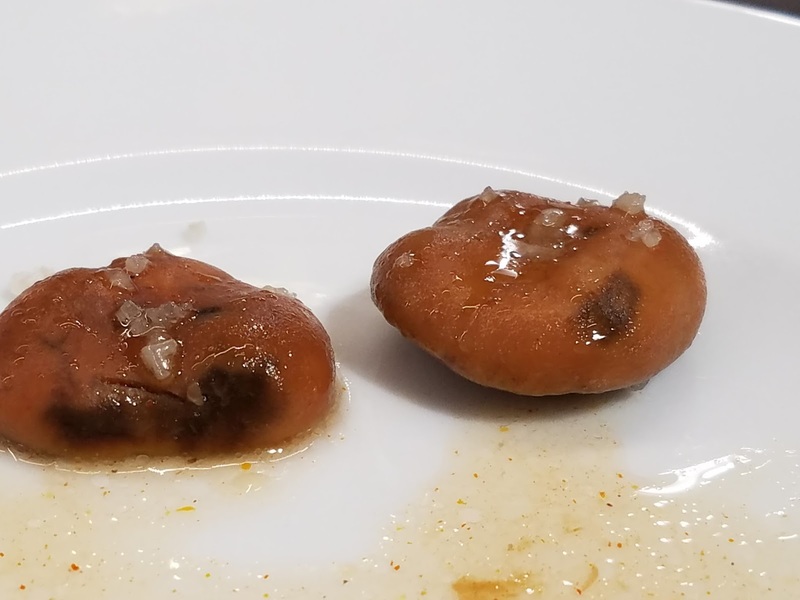 What better way to knock the edge of jet lag, than have a glass of Cava for breakfast, along with a plate of baby squid with small white beans--known in Catalunya as mongetes--topped with a trail of balsamic vinegar (balsamic is never my favorite, but it works with this dish). When I tried to order the xipirons amb mongetes (the baby squid with white beans), Jordi Asín informed us that the dish was not on the menu and, soon, a plate of mejillones aliñados (mussels dressed with chopped peppers and onion in vinegar and oil vinagreta) and Cava, Catalunya's methode champenoise sparkling wine, were placed in front of us by one of Pinotxo’s kitchen crew. Copa de Cava #1! For breakfast! “No tenemos xipirons amb mongetes, pero tenemos garbanzos con morcilla (garbanzos cooked with bits of blood sausage), Jordi told us. “Y dos copas más de Cava, por favor” (another round of Cava, please). The garbanzos soon appeared with refills of our Cava glasses. Cava Round Two, still breakfast. Garbanzos con morcilla (garbanzos cooked with bits of blood sausage) at Pinotxo Bar. 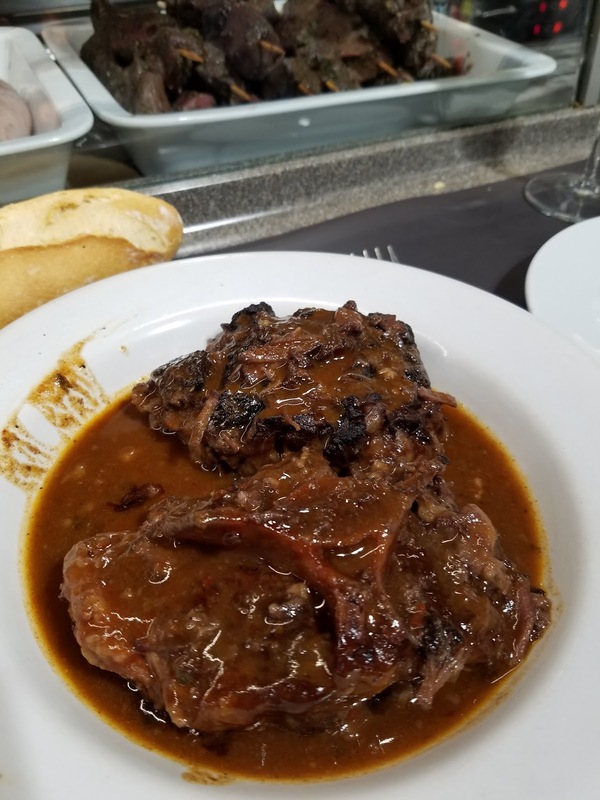 “Oye!, the rabo de toro (bull’s tail stew) is good today,” Jordi said. Soon the dark rich stew appeared and we called for two more copas de Cava to wash it down. 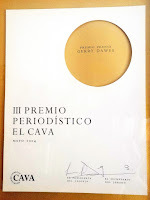 Cava #3, but who is counting? I looked at my Spanish cell phone. It was 11:00 a.m., still breakfast. "The rabo de toro (bull’s tail stew) is good today." We sipped our Cava, ate the rabo de toro and mopped up the rich brown stew sauce with pieces of crusty pa (bread). Jordi came back and told me that the oeufs remenats amb gambes y esparrecs / huevos revueltos con gambas y espárragos (scrambled eggs with shrimp, asparagus and thin slivers of onion) were good. 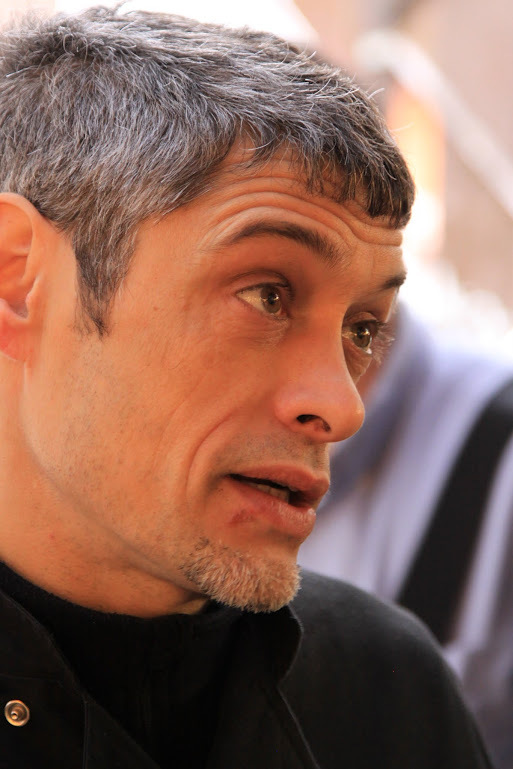 “Vale! Y dos copas más de Cava, por favor.” Cava #4. 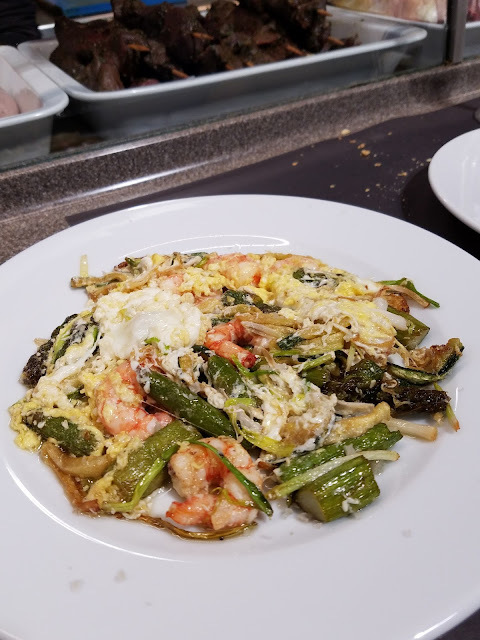 Oeufs remenats amb gambes y esparrecs / huevos revueltos con gambas y espárragos (scrambled eggs with shrimp, asparagus and thin slivers of onion). Suddenly, a couple of small orbs (lamb kidneys?) appeared on a small dish in front of us. 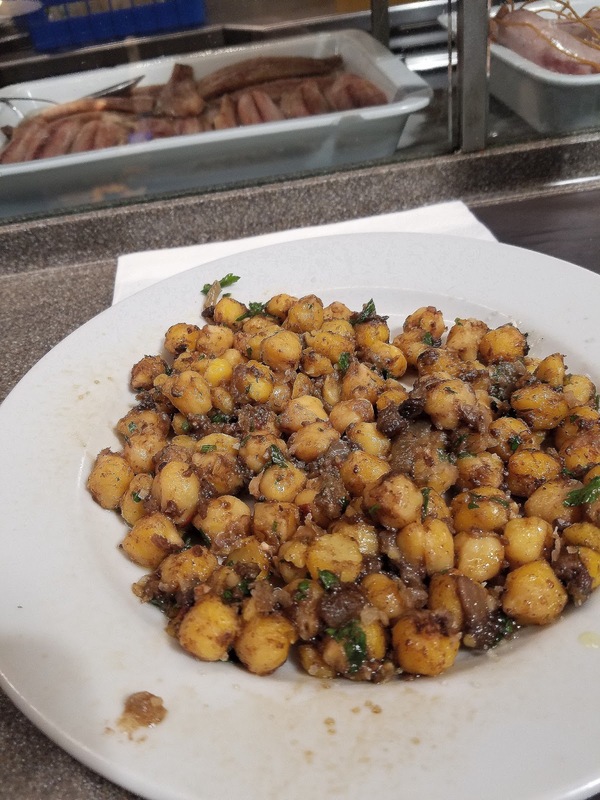 At second look, we saw they were exquisite small saffron milk-cap (also known as red pine) mushrooms, níscalos in Spanish, rovellons in Catalan. Small saffron milk-cap (also known as red pine) mushrooms, níscalos in Spanish, rovellons in Catalan. 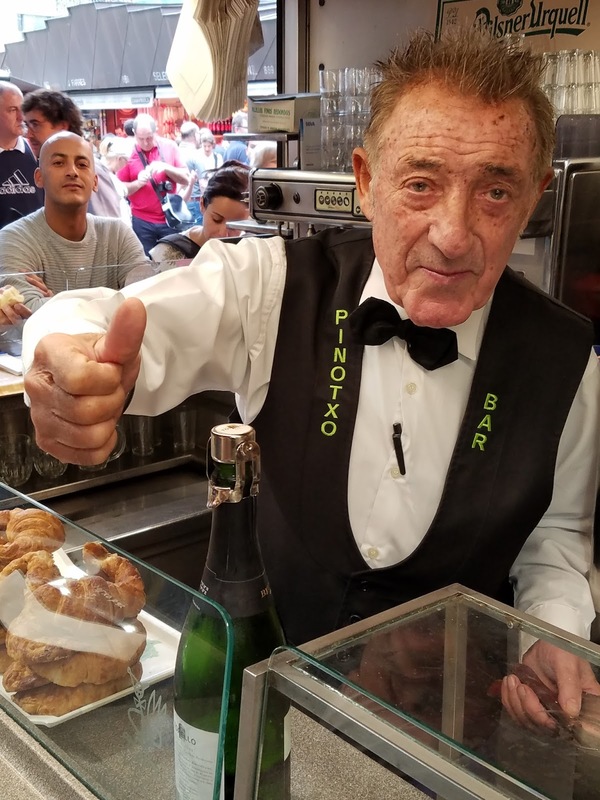 We nibbled on these wonderful ‘srooms and I took pictures of Juanito Bayen with his thumbs up pose and one of the family members, the sharply dressed María José. And we sipped our cava. Was our room ready yet? Not a chance, it was barely past noon! We ordered a full ración, a plateful of the rovellons and a couple more copa de Cava (#5). We were feeling jet lag, but the feeling had passed on into something a lot like reverie. 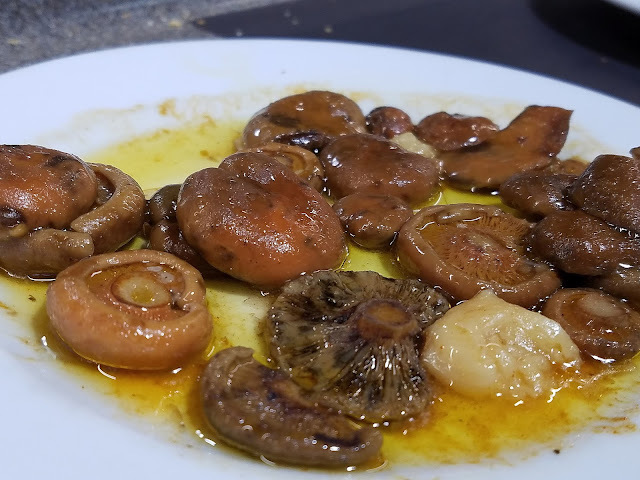 Níscalos in Spanish, rovellons in Catalan. Around 13:00 hours, as they say in Spain, we decided to free up the Pinotxo bar stools and stroll across the market. 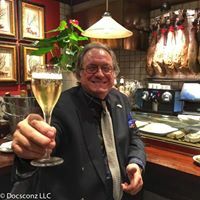 I called Salvador Capdevila, my dear friend who is the owner of Avinova (a specialist in the best seasonal game, foie gras, snails, etc.) and President of la Boquería's Merchant Owner's Association. He answered the call and told us to come over to his stand and meet him. Salvador Capdevila and Gerry Dawes in la Boquería. 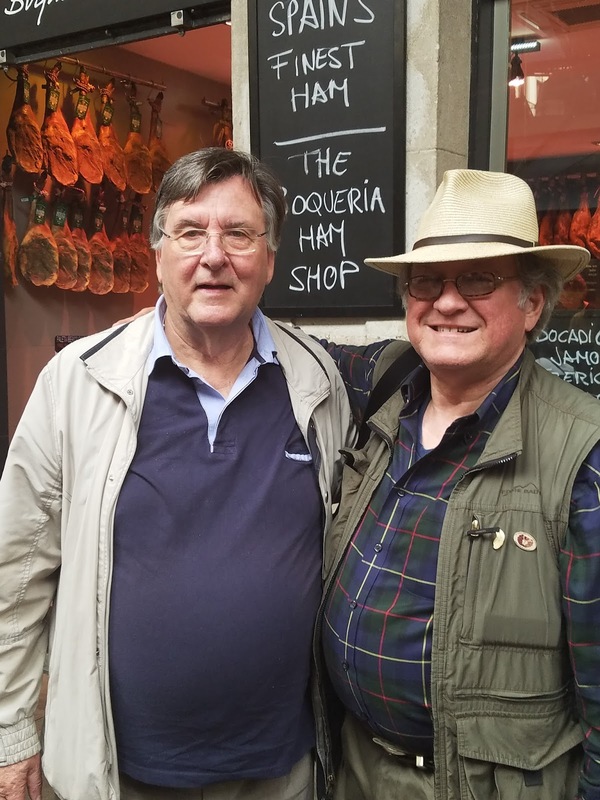 After a big abrazo and some pleasantries he told us to follow him to a nearby jamón Ibérico specialist stand, which declares itself "The Boquería Ham Shop" (there are at least a dozen ham shops in the market) a few feet away on the outer periphery of la Boquería. He introduced us to Sergi, the owner, and Sergi’s assistant Montse Benitez began to expertly carve thin slices of Gran Reserva Jamón Ibérico de Bellota (aged Ibérico ham from pig that gain weight by grazing on acorns a couple of months out in the oak covered hills of Extremadura and northern Andalucía before they are “sacrificed” to grace the palates of lovers of the world’s greatest genre of hams. 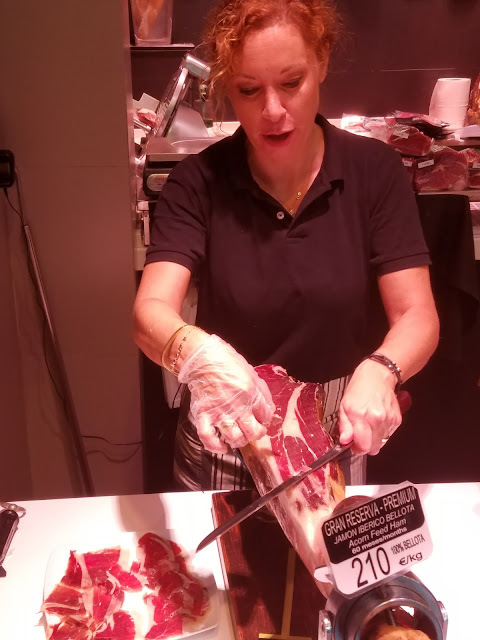 Montse Benitez slicing Gran Reserva Jamón Ibérico de Bellota at The Boquería Ham Shop. 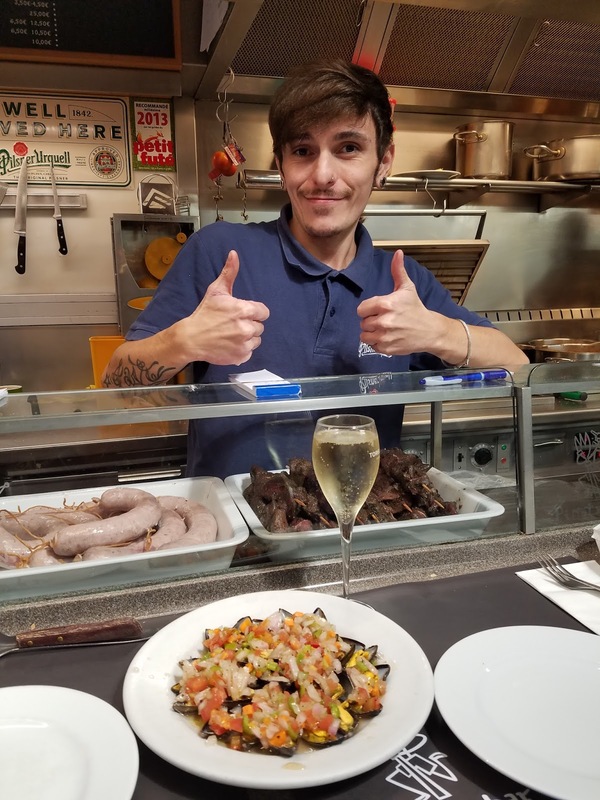 After Montse filled a plate with some 30 Euros worth of Gran Reserva Jamón Ibérico de Bellota (going for €210 per kilo, something over $100 per pound), Salvador took it told him to follow us to a room upstairs where Sergi was waiting with a bottle of Cava! Yes, copa de Cava #6 was soon on it way down and Brad Haskel and I were offering our glasses for a refill and savoring the superb jamón that was laced with those compelling nutty acorn flavors (the oil in the nuts actually imbues the ham with these flavors). Salvador Capdevila, Sergi (The Ham Shop owner) and Gerry Dawes. After we polished off the ham and the bottle of Cava amongst us, I looked at my phone. Ah, 13:30, it was time for our Breakfast of Champions to come to an end. Now, perhaps we could finally get into the pensión for a nap, so we headed back across the Barri Goti. 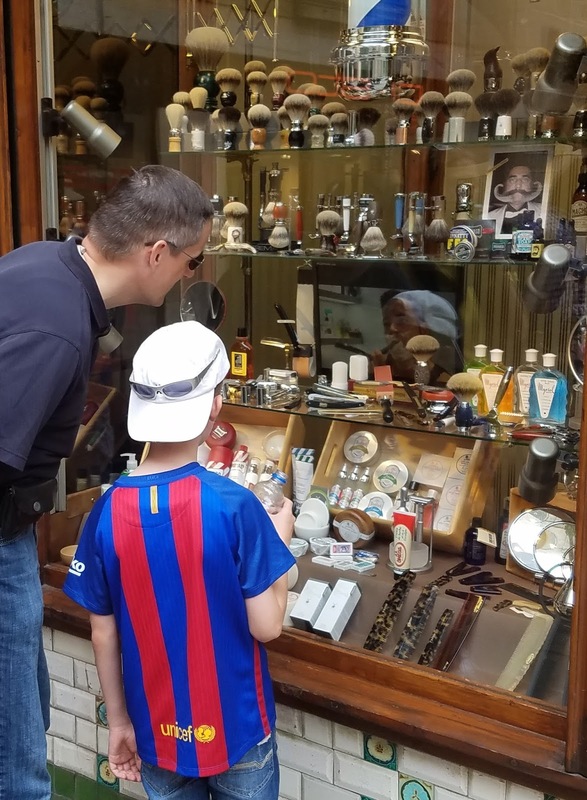 Father and son perusing items in a store window in the Barri Goti, the old quarter of Barcelona. Along the way, I phoned my friend Agustí Torelló Sibil, who with his son, Agustí Torelló Mata, produces AT Roca, splendid sparkling wines (a Brut Reserva and Brut Rosat Reserva that are of Champagne quality, plus several first-rate still white wines from Penedès and an excellent red Montsant from the neighboring province of Tarragona. 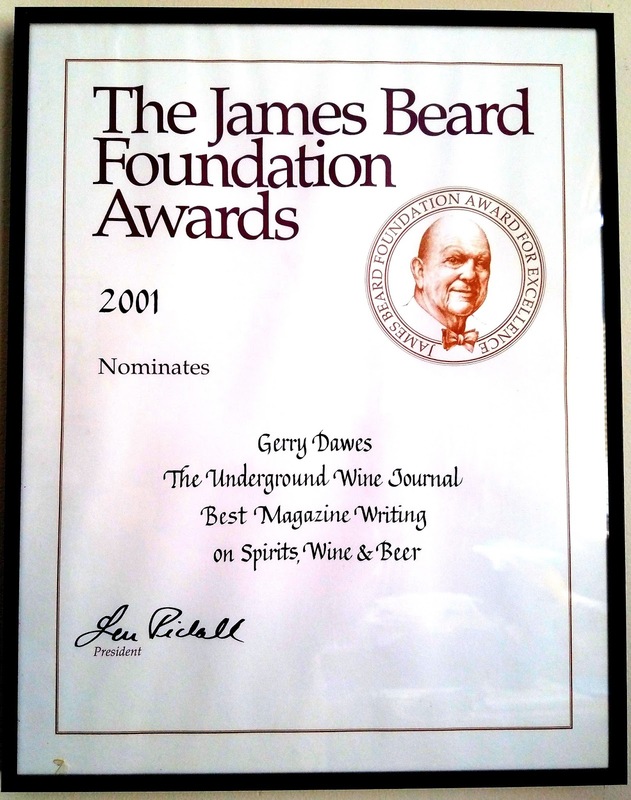 AT Roca, along with some 12 dozen other small producers, recently left the D.O. 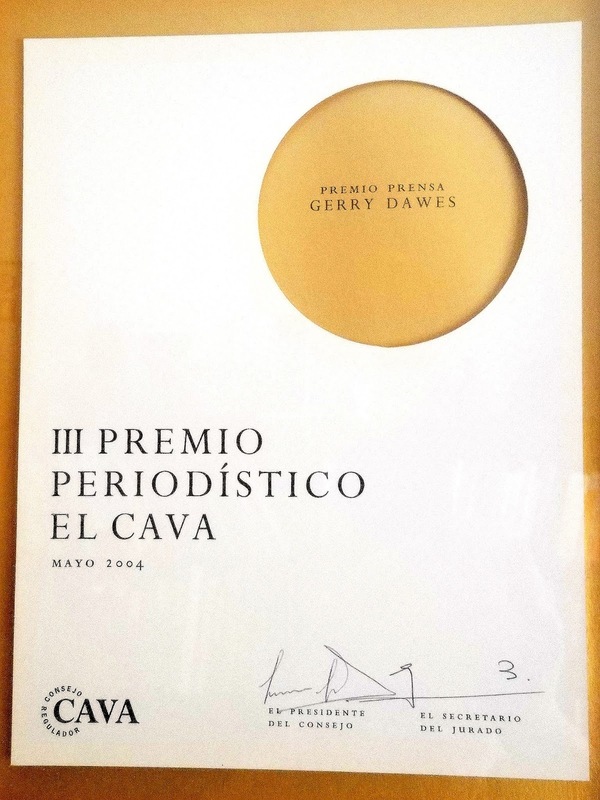 Cava to make wines under the more exclusive Clàssic Penedès designation. Brad and I arrived at the hotel to find our room ready and we went in to go down for a nap. 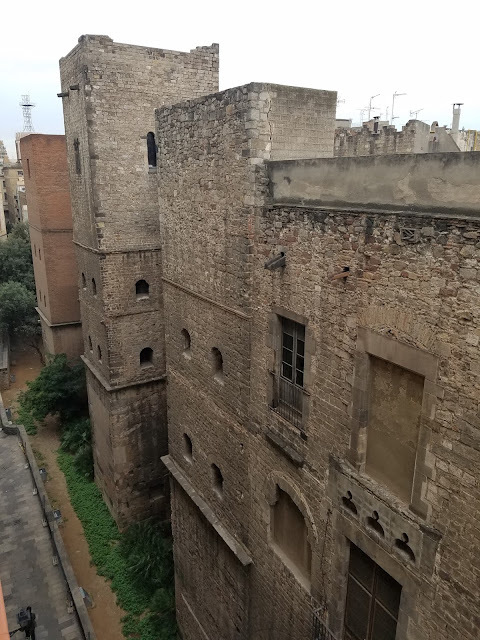 We opened a window to let some air in on this lovely warm day (for January) and saw that we overlooked the ancient walls of the old city of Barcelona and the adjacent spires of the Cathedral de Barcelona. There was no toilet in the room, it was in the hall, but we did have a shower and a sink. There were three beds in the room and we each staked out one and dropped into bed and at 14:30, we began to doze off into a deep slumber that less than two hours was interrupted by a horrific clatter coming from the pedestrian-only street below our window. A small caterpillar excavation machine was jack-hammering the pavement, incessantly, as in, without pause. 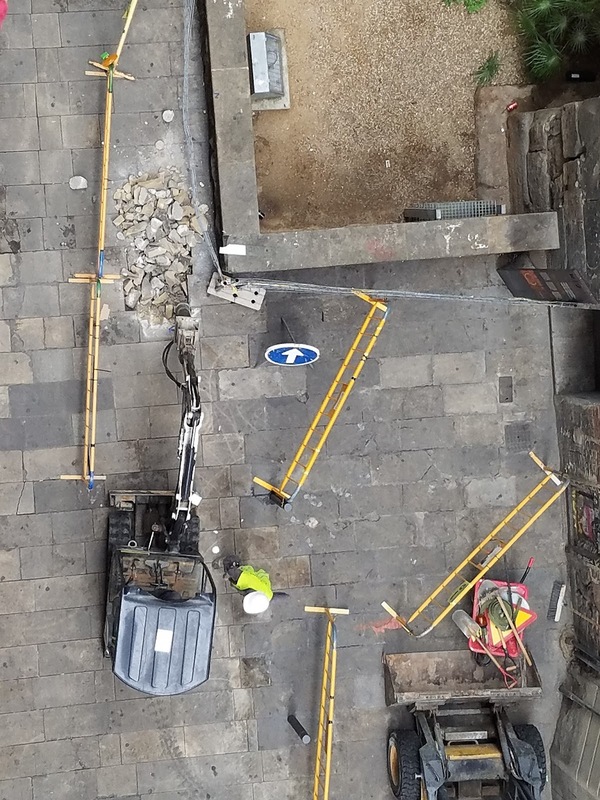 Ancient walls of the Barri Goti (Gothic Quarter), Barcelona, from the sixth floor of Pensión Casablanca. Pavement jackhammer machine below our window at Pensión Casablanca. We didn’t get much sleep, but the Pensión Casablanca had at least given us a place to stash our luggage, had allowed a partial nap, was a place to shower and did not cost a fortune, even considering that we didn’t spend the night there. We showered and dressed, checked out, went down with our luggage to the Vía Layetana to catch a taxi and went to Hotel Majestic to drink some more Cava. 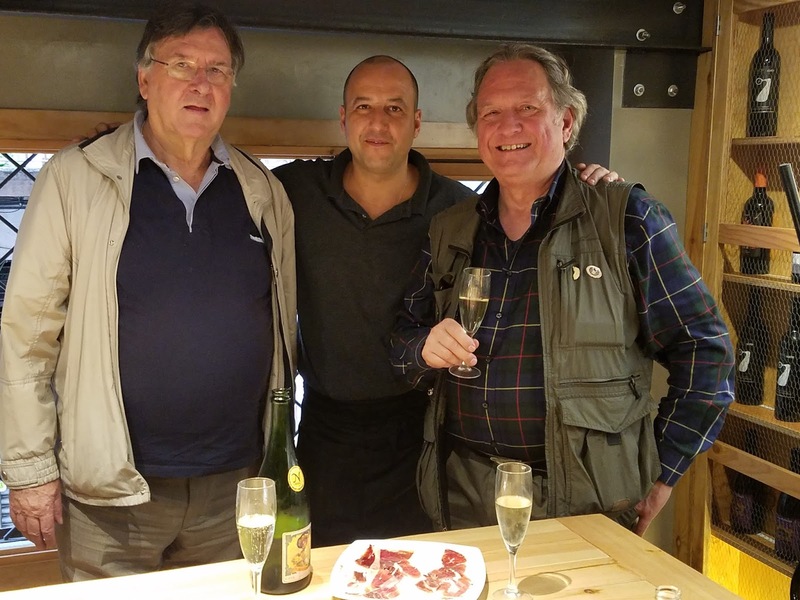 In this day alone, we still had the wine tasting show at the Majestic, dinner with Agustí Torelló and his son and an hour’s drive down to Sant Sadurni d’Anoia, the cava capital of Spain. Today, our first day in Cataluna was packed with adventures and we had not even begun our official tour of the wine routes of Catalunya. 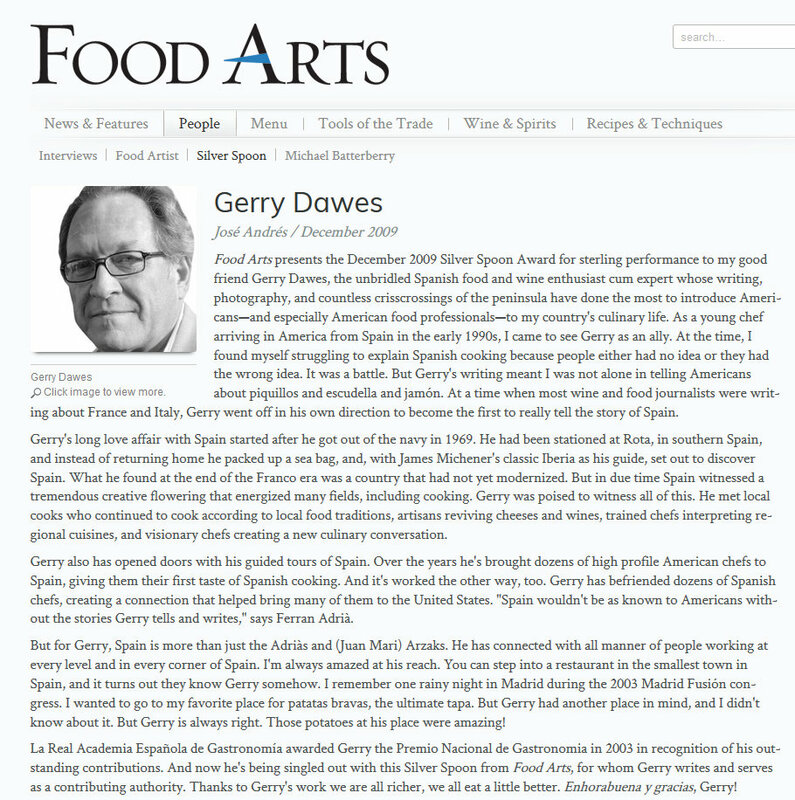 I will continue that story in my next post about our adventures in Catalunya. . .